I recently came across an odd problem having to do with empty print jobs being sent to printers across our network. Since our printers are all configured to first print a cover sheet with the user's username before each job, this would result in dozens of coversheets being printed on various printers throughout our company. After a closer inspection, the jobs being spooled were all named "Remote Desktop Redirected Printer Doc" -- so I knew that Remote Desktop had something to do with it at least. At some point in the troubleshooting process I found that I could recreate the problem at will (which is gold in the technical troubleshooting world). All I had to do was start a remote desktop session from a computer with network printers installed, to an XP computer on our network. I also had to choose the option to redirect local printers to the remote session for it to occur as well. Whichever network printers were installed on the local machine, and were redirected to the remote session, would receive a random amount of these empty print jobs. 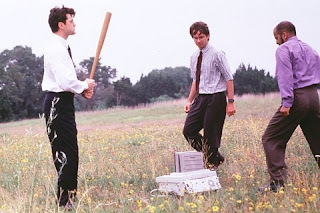 After scouring the internet for awhile, and involving Microsoft support, I discovered that our problem was related to a little 3rd party application called Scan2PC.exe -- which was installed with some drivers to a Dell multifunction printer that all of our executives have. So, if we started a remote desktop session to any XP computer that had this application installed, the problem happened. As soon as I removed the Dell drivers, the problem went away. Since our executives aren't planning getting rid of their brand new multifunction devices anytime soon, our current work around is to uncheck the box in the RDP session to redirect local printers to the remote session. It's crazy how such a small thing can cause so many weird things to happen! Just out of curiosity, what if you have to have printer redirection? Can I just uninstall the Scan2PC software by itself or do i need to remove the drivers? Thanks for the comment! I would first try just removing the Scan2PC software if you can do that, so you don't lose the ability to print to the printer. But if all else fails, you'd probably have to remove the drivers as well. Depending on the manufacturer, they may offer a very thinned down version of the driver for your printer that is just the driver alone -- so you could try searching for something like that as well. Just had this exact problem with a Samsung Scanner Manager. Cheers for this, it pointed me right to it! I thought it was a problem with Terminal Server Print Wrapper and a hotfix sorted it on XP machines, but there isn't any update for Win7 so they were constantly sending redirected blank PDF and XPS jobs. This is exactly the issue I am having with my terminal server, but I do not have Scan2PC, any dell drivers or the Samsung scanning program installed. Just one xerox print driver on the server. How did you determine that it was Scan2PC to blame? Hi -- Basically, I did some Google searches on the topic, and opened a support ticket with Microsoft. Between the two, we were able to get to the bottom of it. Plus, it only seemed to affect our users that has that had the Dell Multifunction devices... everyone else was fine. Had been running into this when using remote desktop into a clients SBS 2003 system for some time. Just kept generating pdfs, and OneNote. Always just turned off printer redirection, but had recently needed to use the printing, and was having the issue with a brand new desktop I was setting up. It was scan2pc.exe , no uninstall options but there was a control panel for the Samsung network printer. followed the crumbs and found scan2pc.exe in the registry in the windows run area. backed up registry branch, deleted key and preparing for a server weekend restart to fix. Get instant freedoms from all technical issues in your Dell printer arising anytime. We provide instant 24x7 help through phone support +44800-098-8354 for remote access.